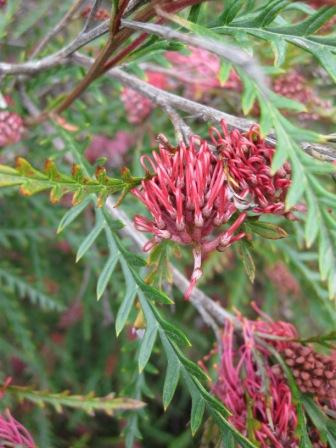 Ornamental large shrub 6-15'x9-12' with fern-like foliage and pink-red toothbrush flowers from winter to summer. Very hardy large shrub for well-drained soils in full sun or partial shade. Tolerant of slightly alkaline soils, heavy frosts and extended dry periods. Excellent for screen or hedge. Grown commercially for cut flowers and foliage. Attracts hummingbirds.